I remarked on R.J.’s way with women (he made love to most of his leading ladies) and married the adorable Natalie Wood – twice! 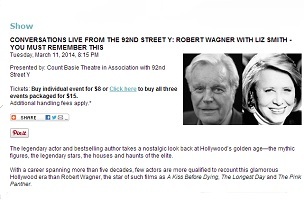 I was careful, however, because in the audience was Wagner’s wife of more than 20 years, Jill St. John. How has Wagner survived, personally and professionally? Well, he is a real gentleman that’s how – intelligent, wise, charming, open and with open arms. The Y event took place a few hours after Wagner’s appearance on Live with Kelly and Michael. That earlier conversation started off with some mutual gushing between Wagner and his former Hope & Faith co-star Ripa. 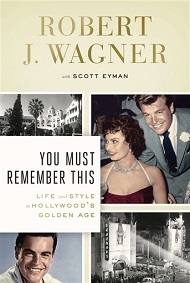 During the Live interview, Wagner also recalled going to the race track with famed gossip columnist Louella Parsons. “I lost a lot of money,” he said of his trips with the journalist-slash-handicapper in her chauffeur-driven car.